We’ve compiled a list of questions (and their answers) that we get asked all the time. If you don’t see your question or concern mentioned here, please don’t hesitate to get in touch with us to ask! Where do the tours start / end? When booking your tour, you will schedule your pickup location. We pick up at hotels, Bed & Breakfasts, marinas, campgrounds, restaurants, private residences. In most cases we return guests to their pickup location. However, if guests wish to be dropped of elsewhere after the tour, we can make those arrangements. Do I get to select which vineyards/attractions will we visit? Certainly let us know when booking if there are particular wineries you wish to see. We always visit a diverse sampling of sites, so that there's something for everyone. Winery/attraction schedules vary, so we may be limited to those open on the day of your tour. You can see many of the wineries available on our wine tours page. Do you service areas outside of Cowichan? Yes, arrangements can be made for group transport anywhere from Victoria to Qualicum or to Vancouver. We have connections with other transport all over the island including Tofino. Our primary shuttles hold 20, 18 and 11 passengers. If your group is smaller than that, you may have other guests joining your tour. If you wish to have a private tour, please request it at time of booking. We have other vehicles available too and will strive to meet your needs. Most tours require a minimum of 4 people. If your party consists of 2 or 3 people, please let us know-we can work it out! A 60% deposit is required to confirm your tour. The remainder can be paid 3 days prior. Etransfers or Credit cards are preferred. Checks can be accepted with prior consent. Our goal with cancellations and reschedulings is to be as fair and understanding as possible. When a trip is booked, other travelers may have been turned away because the date is full. We understand that some circumstances are beyond control. If a wine tour guest or group of less than 4 people cancels 7 or more days before the start of the tour, we will refund the full deposit or issue a full or partial credit/gift certificate towards a later date. For larger wine tour/custom tour groups or private shuttles for wedding or events, we reserve the right to issue a gift certificate credit or partial refund instead of a full refund. In most cases, we can sort out a combination of refund/ future date credit that suits all parties. Cancellation fees may apply based on the size of your group. Fees from $50 to 20% of your total booking) For weddings and private shuttles of any kind, the vehicles and drivers have been reserved for your date/groups and we have likely turned away other groups for that day. 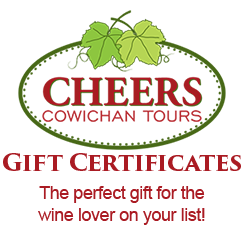 In the event that Cheers has to cancel a trip for any reason, we will do so with as much advance notice as possible and a full or partial refund, credit or reschedule will be offered. For any refunds greater than $700, we reserve the right to set a scheduled reimbursement payment. So for example, if you booked a giant group tour for $3,000 and are entitled to a full refund, we would sort out a scheduled date or dates to reimburse you, likely by credit card or etransfer, depending on how you paid initially. Every attempt will be made to complete reimbursements within 1 month of the scheduled tour date. I don't know much about wine. Will I feel out of place/awkward? No worries! Most people who join our tours are not, nor do the aspire to be wine experts. We make the day light-hearted and fun. The goal is to sample and learn. Some wines you may especially like, some may not be to your taste. It's acceptable and appropriate to 'dump', or not finish those you don't care for. Each tasting bar will teach you a little something unique about their terroir and their products. Do I have to taste every wine offered? No, every Tasting Room provides a spectrum of varietals representative of their vineyard production. If you are only interested in certain wines or dislike particular varietals you are welcome to adhere to your personal tastes. Tipping Pots or “spit” buckets are prominently displayed in most tasting rooms if you prefer to “sip and spit” or if you need to discard a sample. Comfortable clothes and shoes. Anything from jeans to business suits are just fine. Cowichan is a casual dress area where anything goes, but dress for comfort. Comfortable shoes, your ID (if you're super cute and appear underage) optional: camera, light jacket. We provide bottled water and depending on the tour, some basic snacks and appies. Some vineyards offer cheese and crackers and light fare for purchase. When booking, we'll decide whether restaurant meals or picnics are included in your tour. Some people in our group don't drink, how does that work? Please let us know ahead of time if anyone in your group will not be tasting. We can waive their tasting fees. But if they're riding the bus and participating in the tour or meals, general rates still apply. Can I bring my children? Pets? Some tours are not appropriate for all age groups. Please ask for more detail regarding tour with your children. If it does not inconvenience other guests (allergies), pets are welcome if your group is having a private tour. Otherwise, we have several great local boarding/day care options for pets. Is your pet is well behaved or crated? We love critters. Let's talk. What is the best time to tour Vancouver Island? Vancouver Island is a temperate, year-round destination. Most wineries are open year round and if on restricted winter schedules, will often open upon request for our groups. Where is Cheers Cowichan located? We are located in the city of Duncan, just north of Victoria and south of Nanaimo. Both Nanaimo and Victoria offer Ferry Terminals and International Airports. Float plane service (Harbour Air or Saltspring Air) is available from both those cities-flying in to Maple Bay or Lake Cowichan where Cheers can easily pick you up for your scheduled tour. BC Ferries offers daily service to Vancouver Island from the mainland. A one-way trip will take between 1 hour and 45 minutes to two hours, depending on your departure and arrival terminal. Another option is to take a quick 25-minute floatplane with Harbour Air or Saltspring Air. The Island is also well serviced by international and regional airports. Please let us know if you have any questions about transportation to and from the Island. We would be happy to suggest the best way to get here! If I buy wine on the tour will it be stored safely and in a temperature-controlled environment? Yes, during warm summer days our vehicles are equipped with coolers to ensure wine purchased is kept in a temperate conditions — our guides will happily assist you to store any purchases. Boxes or bubble wrap bags can be purchased if you wish to travel home with your bottled goodies. Should I tip my Guide/Driver? Our guides and drivers appreciate acknowledgement for providing exceptional service — gratuities range from 15-20% of the value of your tour and may be added in advance or paid directly to the guide at the conclusion of the Tour. We always welcome feedback from your experience — please feel free to let us know your thoughts, suggestions, or concerns.